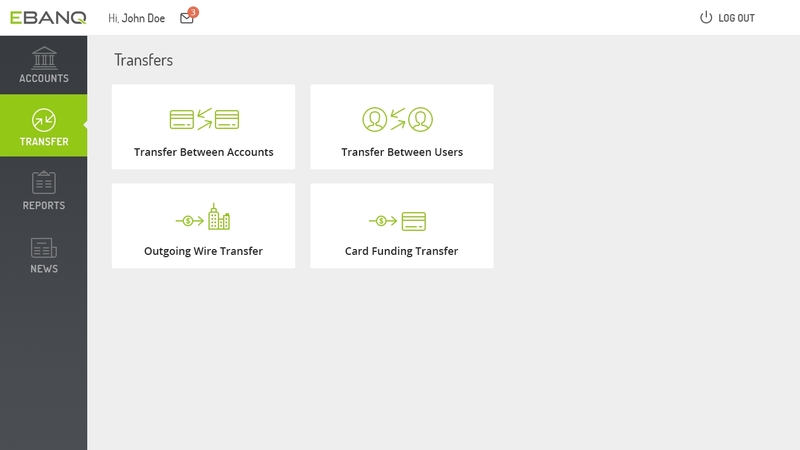 Who said online banking cannot be beautiful? EBANQ® is the most user friendly online banking software app on the market. It is a turn-key solution for banks, Electronic Money Institutions (EMI), Payment Institutions, Remittance Companies, Finance Companies, Trust Companies, Savings & Loan Associations, Credit Unions, Forex Companies, Asset Managers, Cryptocurrency Exchanges and anyone else managing client funds. It is also the only mobile ready ''out of the box'' solution in its market segment. The EBANQ banking app loads fast on all devices and works great with all major browsers. No additional investment required for Mobile Banking. Transparent straight forward pricing. 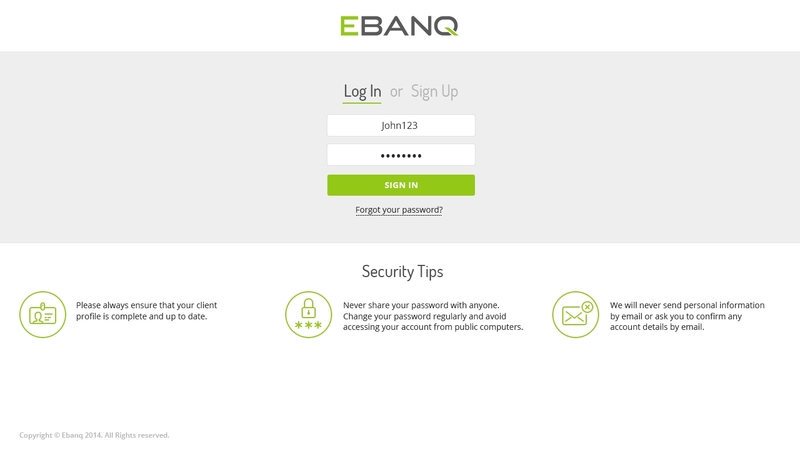 You can easily customize the EBANQ Online Banking Software App by uploading your own logo, changing colors and icons, achieving your own look and feel in seconds. State-of-the-art cloud technology, bank-grade SSL encryption, and fully scalable to meet your requirements, whether you have five end-users or five million. Do not take our word for it. Check out the system yourself by clicking on the various screen shots below. Please remember that the colors, logos and other design elements can easily be customized, for your own look and feel. This is the login screen for both end-users and administrators. The color scheme, custom logo, as well as the text blocks (security tips etc) can be edited through the standard administrator settings. You can achieve your own look and feel in seconds. This is the landing page after end-user login. 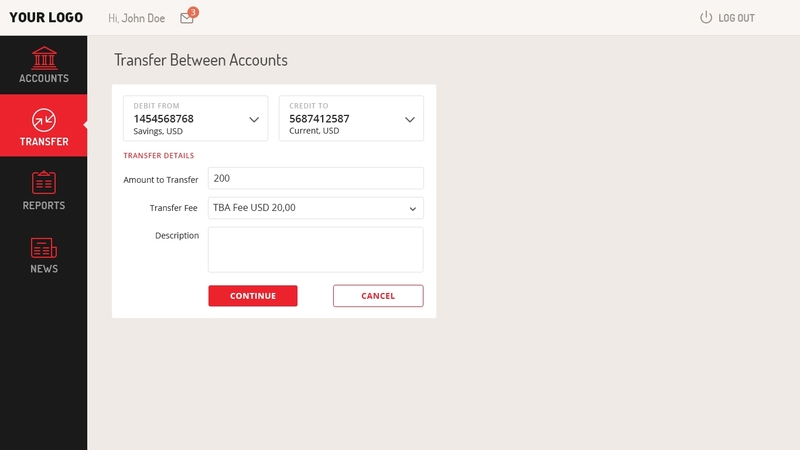 The screen displays the latest transactions, current balance, and secure message notifications, as well as the main menu with additional options. The user can easily switch between accounts (if multiple) using the drop down menu. The search function can be used to display custom date ranges, and/or to search for specific transactions using any parameter, such as amount, description, sender, recipient. This screen is displayed when an end-user clicks on the "Transfer" option in the main menu. 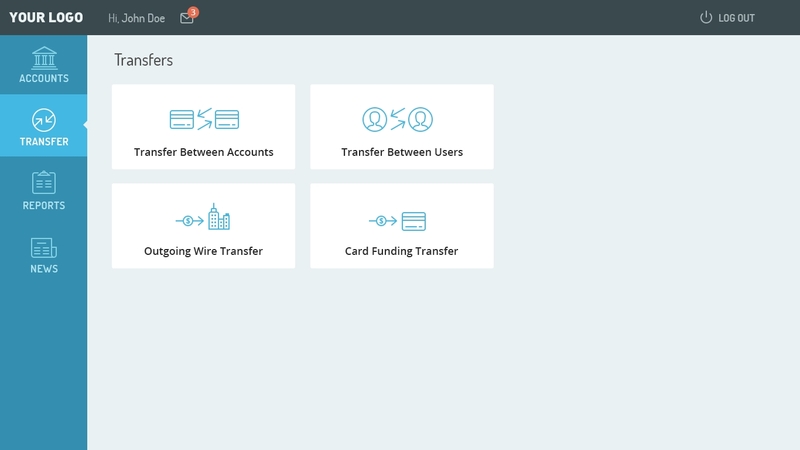 The user can choose from transfers between own accounts, to another user within the same bank, or to an external account at any bank, by wire transfer. 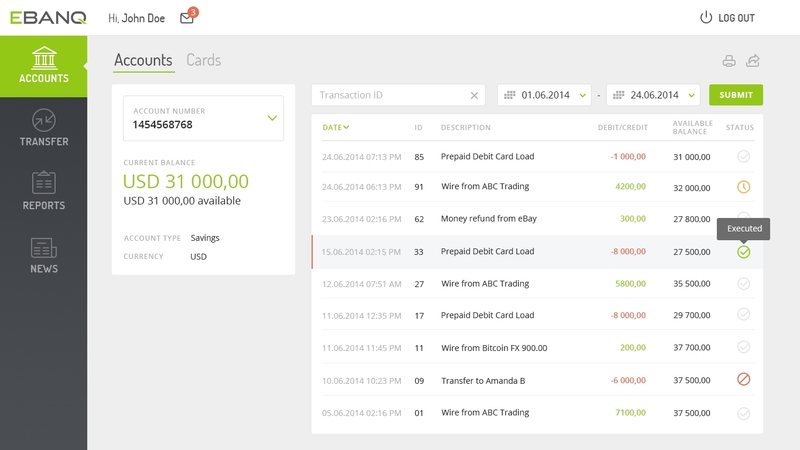 The card funding option only appears if the card feature has been enabled in the admin interface. Submitted transfer requests appear in the admin interface, after having been properly authorized by the user, applying the additional TAN code security feature for outgoing transactions (if enabled in the admin interface). This form is used by end-users to request a transfer to an external account at another bank, by wire transfer. The form complies with the standard SWIFT format for international payments. Intermediary (correspondent) bank information fields are only displayed when a user ticks the relevant box, "Specify Intermediary Bank". This provides for a shorter, more straight forward form, since most users typically provide Beneficiary Bank information only. 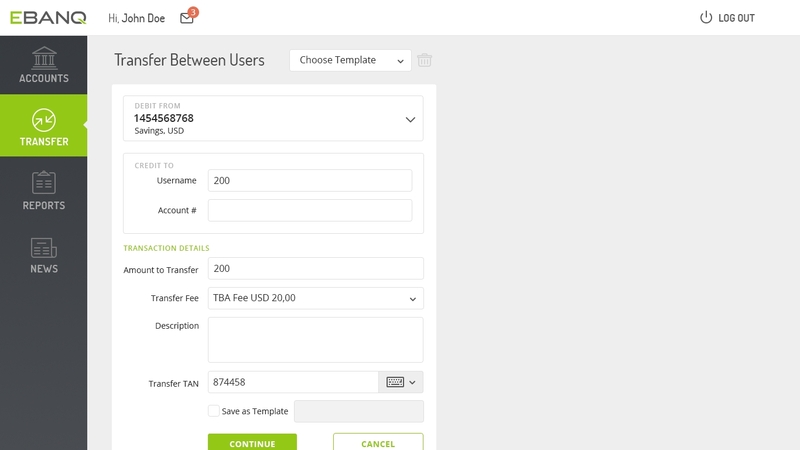 This form is used by end-users to request funding of pre-associated cards (if any). 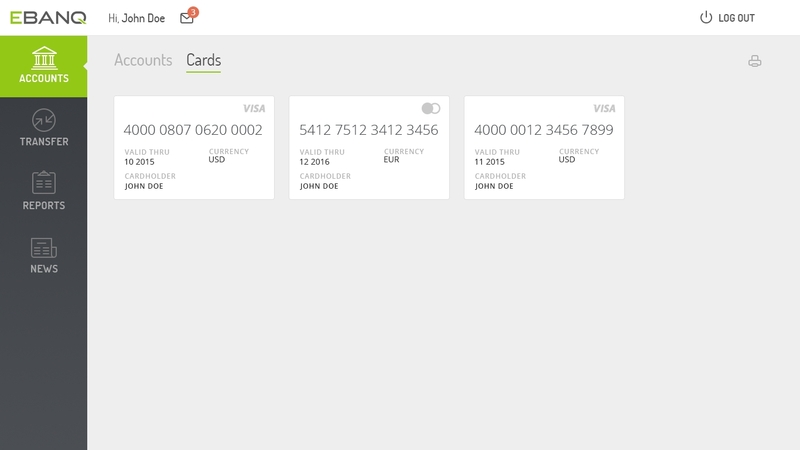 This feature is only visible in the end-user interface if the card feature has been enabled in the admin settings. This screen shows the EBANQ form used by a end-user to transfer funds to another user with an account in the same bank. In this example, the additional TAN code security feature has been enabled in the admin settings, meaning that outgoing transactions require two-factor authentication. This screen shows any associated cards, if applicable, when the user clicks on the "Cards" tab. Note that if the card feature is disabled in the admin settings (for institutions not offering cards), no reference to cards will be visible throughout the system. 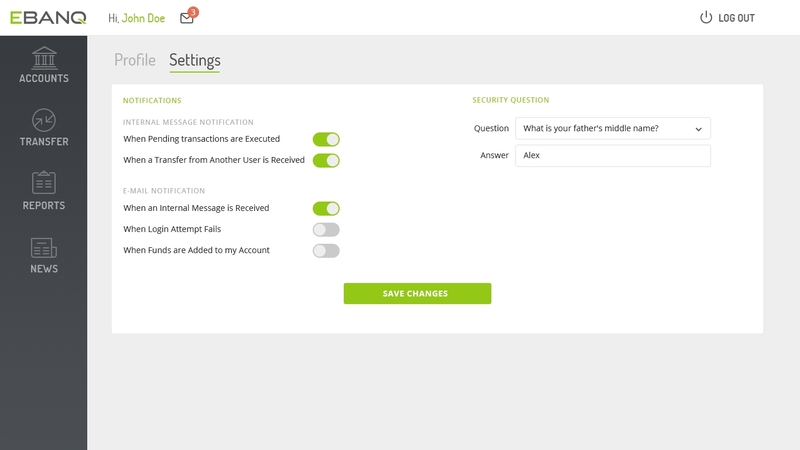 This screen shows user settings for email notifications, and for the security question (used for password recovery). 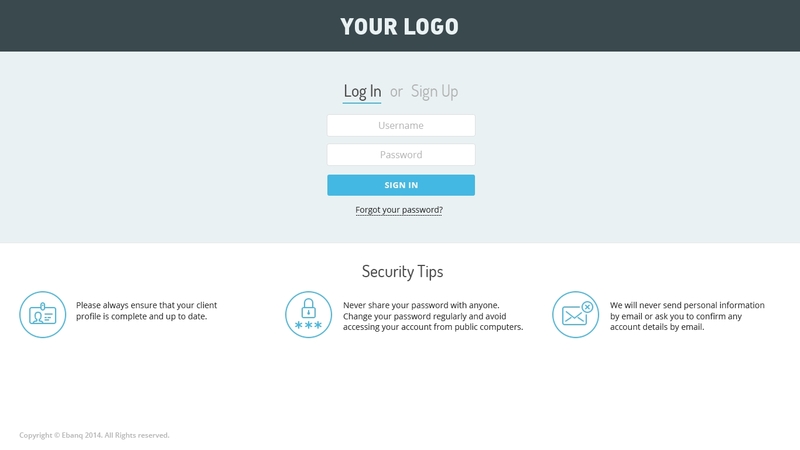 This is the login screen for both end-users and administrators. The color scheme, custom logo, as well as the text blocks (security tips etc) can be edited through the standard administrator settings. You can achieve your own look and feel in seconds. This particular image shows the system with a blue color scheme, and without the EBANQ logo. Are You Ready for EBANQ? © 2011 – 2019 EBANQ Fintech SL All Rights Reserved. No banking or financial service is offered on this website. EBANQ is a trademark and property of EBANQ FINTECH S.L. Google Play and the Google Play logo are trademarks of Google Inc. Apple is a trademark of Apple Inc., registered in the U.S. and other countries. App Store is a service mark of Apple Inc., registered in the U.S. and other countries. Any other trademarks are the property of their respective owners. My personal data may/will be disclosed by EBANQ FINTECH SL to its third party service providers or agents (including its lawyers/law firms), for one or more of the Purposes, as such third party service providers or agents, if engaged by EBANQ FINTECH SL, would be processing my personal data for EBANQ FINTECH SL for one or more of the Purposes. By clicking ACCEPT, I represent and warrant that I am the user and/or subscriber of the telephone number(s) as set out in my application form, account opening documents and/or otherwise provided by me or possessed by EBANQ FINTECH SL, and that I have read and understood all of the above provisions, including the Personal Data Protection Terms and Conditions. Sorry, you cannot submit the form without accepting our terms and conditions.